Here we go again: A jaguar that was brought out during an Olympic torch event earlier this week was shot and killed shortly afterward when it escaped its handlers. The local Games organizing committee is now investigating the incident, but animal welfare advocates say the big cat should never have been there in the first place. Following the event, Juma was taken to a zoo that’s part of a military base in the city. She apparently escaped an enclosure but was not at risk of leaving the confines of the zoo. Military officials said Juma was hit with four tranquilizer darts, but they didn’t slow her down. Once the cat turned on a veterinarian, a soldier was forced to take her down with bullets. 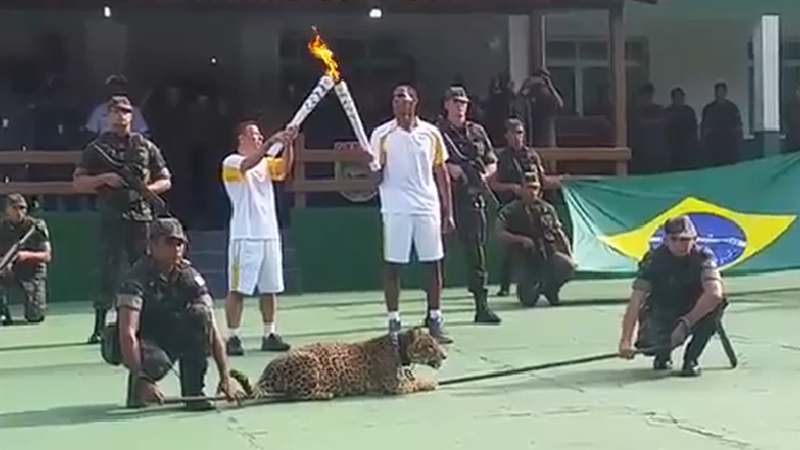 What the hell was a jaguar doing at an Olympic torch event, you ask? Well, a jaguar named Ginga happens to be the official mascot of the 2016 Olympic Games in Rio de Janeiro. The local Games organizing committee obviously thought it would be cute to trot out an actual jaguar for a public event—an idea that has now led to the death of an animal that had been raised in captivity since it was cub. The incident comes less than a month after a 17-year old Western lowland gorilla named Harambe was shot and killed, when a young boy accidentally fell into its enclosure. Cincinnati Zoo officials made the decision to shoot the gorilla for fear that it would harm the child. Similar to Harambe, jaguars are an endangered species, prompting the inevitable question: why are threatened animals still being put into these kinds of situations?